Italgi manufactures a wide range of machines and equipment for the production and treatment of edible pasta, meeting all the needs of pasta professionals, from handicraft laboratories to medium-sized companies. The range includes: single and double-hopper extruders; pasta sheeters and cutters; gnocchi forming machines for traditional or stuffed gnocchi; special machines for cavatelli, trofie and strozzapreti. It also studies and produces cookers, pasteurizers and pre-dryers; on request, even lines for the production of ethnic stuffed pasta (as for example pansoti, casoncelli or empanadas) as well as customised automatic lines are available. One of the recent developments is Pasta Idea, a new line including a full range of workstations equipped for fast cooking of pasta (show cooking), and its evolution Pasta Idea Mobile. 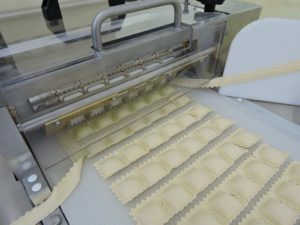 In recent years, the company has also launched a vocational school for potential pasta-makers and for all those who intend to take up an activity in the field of gastronomy, where pasta is the main ingredient.